This set includes easy one-hand operation, 72 tooth ratchet for high torque ratcheting along with a low profile directional lever helps reduce catch points and deep laser etched markings for easy socket size identification. Knurled beauty rings that provide a non-slip gripping surfac. Deep laser etched markings for easy socket size identification. 72-tooth gear system is designed for high torque ratcheting. Low profile directional lever helps reduce catch points. 5 Degree arc swing and slim head design. One (1) each: 1/4, 3/8, 1/2 in Drive Pear Head Ratchet. One (1) each: 1/4 in Drive 6pt sockets: SAE 5/32, 3/16, 7/32, 1/4, 9/32, 5/16, 11/32, 3/8, 7/16, 1/2, 9/16, Metric 4, 5, 6, 7, 8, 9, 10, 11, 12, 13, 14. One (1) each: 1/4 in Drive, 6 pt deep sockets: SAE 5/32, 3/16, 1/4, 9/32, 5/16, 11/32, 3/8, 7/16, 1/2, Metric 4, 5, 6, 7, 8, 9, 10, 11, 12, 13, 14. One (1) each: 1/4 in Drive Extensions: 3, 6, 10 in. One (1) 1/4 in x 3/8 in Increasing Adapter. One (1) 1/4 in Drive Universal Joint. One (1) each: 3/8 in Drive 6pt sockets: SAE 1/4, 5/16, 3/8, 7/16, 1/2, 9/16, 5/8, 11/16, 3/4, 13/16, 7/8, Metric 10, 11, 12, 13, 14, 15, 16, 17, 18 , 19, 21. One (1) each: 3/8 in Drive, 6 pt deep sockets: SAE 1/4, 15/16, 3/8, 7/16, 1/2, 9/16, 5/8, 11/16, 3/4, 13/16, 7/8, Metric 10, 11, 12, 13, 14, 15, 16, 17, 18, 19, 21.3/8. One (1) each: Drive Extensions: 3, 6, 10. One (1) 3/8 in x 1/4 in Reducing Adapter. One (1) 3/8 in Universal Joint. One (1) each: 3/8 in Drive Spark Plug Socket 5/8 in, 3/8 in Drive Spark Plug Socket 3/4 in, 3/8 in Drive Spark Plug Socket 13/16. One (1) each: 3/8 in Drive hex bit sockets: 5/32, 3/16, 1/4, 5/16, metric, 4, 5, 6, 7, 8. One (1) each: 3/8 in Drive torx bit sockets: T10, T15, T20, T25, T27, T30, T40, T45. One (1) each: 1/2 in Drive 6pt sockets: 7/16, 1/2, 9/16, 5/8, 11/16, 3/4, 13/16, 7/8, 15/16, 1, Metric, 13, 14, 15, 16, 17, 18, 19, 21, 22, 24. One (1) each: 1/2 in Drive, 6pt deep sockets: SAE 7/16, 1/2, 9/16, 5/8, 11/16, 3/4, 13/16, 7/8, 15/16, 1, Metric 13, 14, 15, 16, 17, 18, 19, 21, 22, 24. One (1) each: 1/2 in Drive Extensions: 2.5, 5, 10. One (1) 1/2 in Drive Universal Joint. One (1) 1/2 in to 3/8 in Drive Adapter. 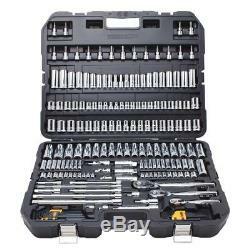 One (1) 14 piece standard hex key set. One (1) 14 piece metric hex key set. If an item ships for free to a commercial address it will be noted on the product page. If the item is opened or has been used we reserve the right to refuse return. Toolbarn has been an online tool superstore since 1998. You may also be interested in.. The item "DEWALT DWMT75049 192-Piece Mechanics Tool Set (SAE & Metric)" is in sale since Friday, March 30, 2018. This item is in the category "Home & Garden\Tools & Workshop Equipment\Hand Tools\Hand Tool Sets". The seller is "toolbarn" and is located in Carter Lake, Iowa.